Oh, yum! I’m thinking small loaves would be good for holiday gifts. Or just one big tube cake for me. This has my favorite flavor combo in it. I think I see this in my kitchen in the very near future! Holy crap, this looks good! I’m cursing this damn diet I’m on. Here’s the link. Have made this…yum! everything about this recipe, from the photos you took, to the title, make me drool!!!!!!!!! this cake looks sooo good but i’m thinking to try half the recipe?so what u suggest for the eggs amount and also it’ll be fit in the 9″ loaf pan. ?thankyou so much and waiting for your reply. I’ve tried this recipe three times and only once did I have success with it. The other times the cake fell and had a heavy greasy place in the bottom. was cooked in a tube pan. I divided the recipe and cooked it is a 9″ loaf pan and I had success with it. Looks yummy! I am going to try this one for my mother’s birthday. I made this cake yesterday and I was very please with it although I like my cake with a little more flavor then the recipe call for so I added a little more flavor according to my tast and I will be making this again thank you. Hey you said that you used 2 loaf pans. How much batter did you put in each? This cake is very good. I was convinced I’d made the batter incorrectly because it was so thick (I had to really stir!). I wouldn’t recommend this cake to diabetics, as it is extremely sweet. Friends liked it very much and co-workers got the leftovers today, and it was very popular with them, too. I think it actually tasted better after being in the refrigerator for day, wrapped in aluminum foil. It’s a keeper. Gorgeous photos and amazing looking brown sugar pound cake with caramel glaze! I am obsessed with desserts! I’ll definitely try it! Thanks a lot for sharing! This cream brown sugar pound cake just looks SO incredibly delicious and I am so craving a slice right now! 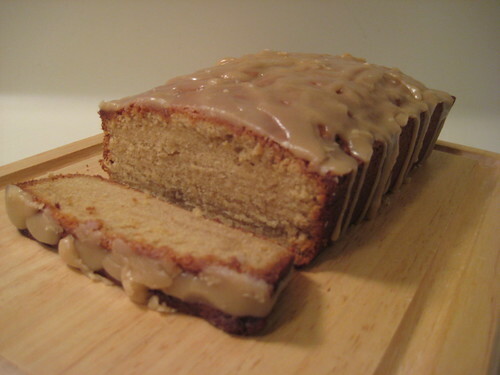 I had a similar cream brown sugar pound cake at a party recently and found myself craving it and wondering if I could recreate it today. This brown sugar pound cake with caramel glaze is stunning. I’m not a talented baker, but I would love to give these a try!